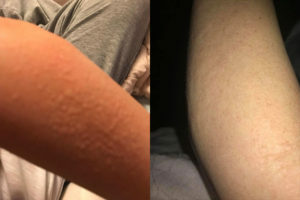 Here are before and after pictures of an allergic reaction my client was having to her dog’s dander. I offered her one 30 minute remote session with my LumiVibe Pro6 controller on an immune support allergy sweep setting. Her arm improved right after the session as illustrated in the after picture. Karyn Kidd – Light owner and energy practitioner. You can receive a remote light session at any time of the day or night in any location. We invite you to set a specific time and intention and listen to one of our guided audios or group conference calls to optimize the effect.